For starters, Sevilla announced a partnership with Unicef today that will promote and raise funds for the humanitarian aid organization’s campaign to fight childhood malnutrition in Ethiopia. I’d like to point out that I suggested this on Friday, so I think it’s safe to say Del Nido reads the blog regularly. 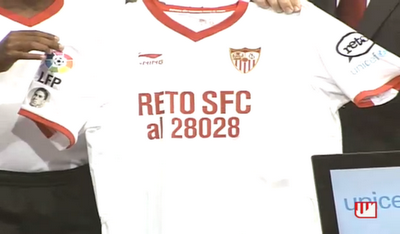 The comparisons to Barcelona are inevitable, so I’ll just note that while Barcelona’s use of the logo looked about 20,000 times nicer, Sevilla’s is much more practical. Barca’s use of the logo was, I guess, to remind you of the existence Unicef in case you forgot (and also, you know, help out with the “mes que” branding, etc) and not much else, but Sevilla’s has a number you can use on your phone to donate to Unicef’s “Reto” cause. I like it, although I’d like to emphasize once again that they might have found a decent designer to maybe do some pro bono de-uglification work. Del Nido says this will be until “at least” December 3; I guess at that point they will have solved world hunger and will be ready for the next sponsor/world problem. At least they’re not facilitating extramarital affairs or using any number of other possible humiliating sponsors. All jokes aside, though, please visit RetoUnicef’s site, and consider donating to help fight against an ongoing and devastating tragedy and to help fight for a basic human right. If you can’t donate, please visit the links anyway to better understand what’s at stake for these kids, and how much can be done, for how many, for very little money. (For example, 15 euros provides enough water tablets for 110 families to drink potable water for a month. A month!) The site unfortunately appears to only accept donations from Spain, but if you’re inspired to help, not living in Spain, and want to help Unicef specifically, you can visit their home site to donate. The usual Liga rant (“corrupt”). More specific TV revenue information (Rosell and FCB are looking at alternative proposals and assume there will be changes). Sevilla’s current status in relation to their previous success and recent struggles (“The change of cycle has been done non-traumatically. Sevilla continues among the greats.” Quick, someone tell Guardiola Sevilla’s president thinks they’re good after all!). Past, present, and almost-but-not managers (“Hopefully another trainer will achieve what Juande did”, “Maybe someday we’ll be able to judge the work of Jímenez”, “I’m not sure what would have happened if we’d signed Bielsa. I think we chose right with Marcelino”, “We have a fantastic manager–in the Barcelona game you could see the effect of his work”). The forward problem (“The team has suggested some options to Marcelino and he has discarded some”, “We’ll try to find a forward Marcelino likes. We won’t spend the money on Gio, he’s not worth 11 million”, “We have not had any contact with Bendtner”). There’s a lot there to digest, so everyone feel free to pick out a comment and expound, pontificate, or otherwise engage in raconteurishness. And oh yeah–we play another game tomorrow! Marcelino will be hosting his old club, who have not fared particularly well since the departure of their trainer (and their Mexican firecracker): winless through 8 games, on a -9 goal differential, and in last place in the standings. If it’s tough for mid-level clubs to compete for the league, it’s damn near impossible for the littler guys down the line to even survive in this Liga. Racing were always going to struggle given so much turnover, but these guys were in the top half of the table last year–this is a pretty bleak turnaround. So it should be an easy win, but of course we’ve got several absences for this game, which we shall now review: Kanoute will be in timeout for his uncharacteristic explosion after Cesc insulted him this weekend, Navarro will similarly have an opportunity to ponder his mistakes after picking up a pair of yellows in the same game, Negredo does not look healthy yet, Perotti is still not recovering from injury, Dos Santos still plays for Tottenham, Kone is on loan to Levante, Rodri is on loan to Barca B, Guarente continues to his 18-month recovery from playing 3 games for us, and…I think that’s all, actually. Still, though: hay que ganar. Looking ahead a moment, this weekend we get Granada, fresh off what I assume will be a mid-week angry Barca spanking, and then we have an away match at Mallorca and a mid-week Copa del Rey matchup before another international break. I’d like to get to that break on a four-game winning streak, and I really think we’ve got a chance to pull that off. Maybe after the break we could even have a healthy first choice starting XI?!? I know, I ask too much.